Diana Rattray. The Spruce Eats, 2014. 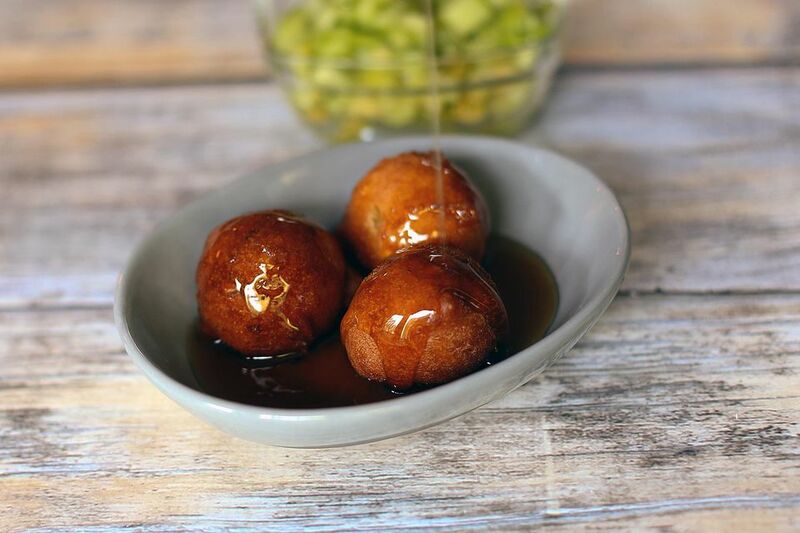 These delicious fritters are light and fluffy little doughnuts, perfect for a breakfast or coffee snack cake. And they're an excellent way to enjoy the last of the green tomatoes. Roll them in cinnamon sugar or serve warm with syrup. The fritters also freeze well, and you could thaw and warm them in the oven or microwave. In a deep, heavy pan, heat about 2 to 3 inches of oil to 365° F.
Combine 2 1/4 cups of flour with the granulated sugar, baking powder, salt, and soda. Stir in the green tomatoes and corn. In another bowl, whisk the eggs with the milk and melted butter. Stir into the first mixture until blended. Add more flour if necessary to make a thick batter. The batter should hold its shape when dropped into the hot oil. Working in batches of 5 to 6 fritters, drop the batter by tablespoons into the hot oil — Cook for about 3 minutes, or until deep golden brown, turning about halfway through. Remove to paper towels to drain. Roll in cinnamon sugar, dust with powdered sugar, or serve with maple syrup or golden cane syrup.